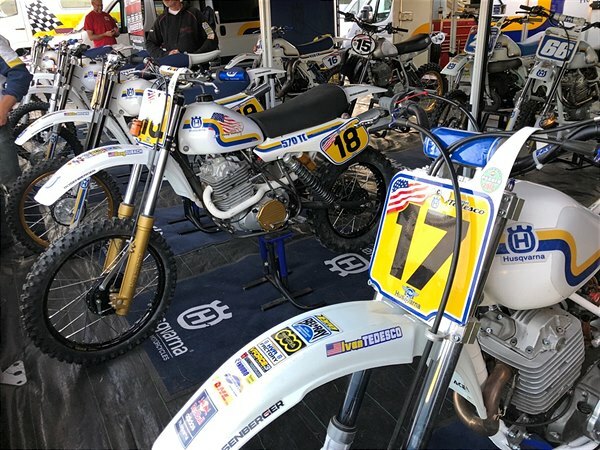 Team USA’s Mike Brown, Doug Dubach, John Dowd and Ivan Tedesco have dominated the 2018 Veterans Motocross des Nations by riding to victory a range of immaculately prepared classic Husqvarna motocross bikes at Farleigh Castle in England. Held as a homage to the golden years of motocross, the event saw riders and fans from all over the world come together in the UK to race and marvel at the machinery of a by-gone era. With Husqvarna enjoying huge success during the 70s and 80s, that form was repeated at Farleigh Castle where the majority of wins were taken on Swedish machinery. With a wide array of stunning bikes on display covering the history of the sport, plus former pro riders free to talk to the fans and sign autographs, the entire weekend saw a great atmosphere enjoyed by the thousands of classic motocross fans in attendance. One of the biggest fans of all is Kris Rosenberger. The former rally champion, who now manages one of the largest Husqvarna Motorcycles dealerships in Austria, is an avid race fan and passionate collector. Rosenberger provided the Husqvarna machinery for both Team USA and Team Austria at the event. Now in its 10th edition, the popular race meeting was contested by 14 twin-shock teams and 13 EVO class teams for bikes manufactured up to 1996. In front of a large crowd of knowledgeable and passionate fans, the veterans put on a superb display of riding on the fast, yet bumpy Somerset track. Despite the age of the machinery and the riders, the racing was action-packed with former champions from a number of different countries fighting for the win. Finishing as runner-up to England in the 2017 event, Team USA crossed the Atlantic with a score to settle. Under the management of Rosenberger, the American aces scored the double by winning both the EVO and Twin-shock Team races. USA’s Mike Brown won no less than six motos over the course of the weekend – all four twin-shock races and two in the EVO class. The former AMA 125 Motocross champion was unstoppable on his Husqvarna 500 TC. Husqvarna Motorcycles would like to give a special thank you to Kris Rosenberger for his hard work in supplying the bikes and helping to organise such a successful meeting.